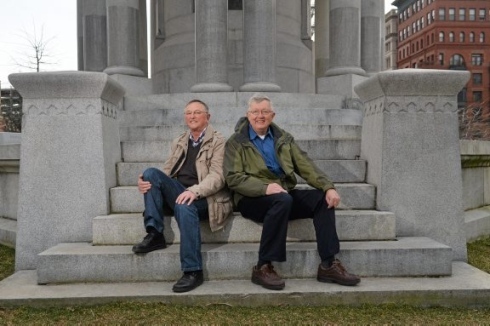 By Jim Lockwood (Staff Writer) Anyone glimpsing two Richard Krebses in Northeast Pennsylvania this week is not seeing double. Richard Krebs of Wallenpaupack Lake Estates in Paupack Twp. is hosting his German doppelganger, Richard Krebs, the mayor of Bischbrunn from the German state of Bavaria. It was last year when the American Mr. Krebs stumbled upon the German Mr. Krebs' website while doing genealogical research and immediately did a double-take. Along with having the same name and being the same age (at that time 64 years old), the other man bore an uncanny resemblance to Mr. Krebs of NEPA. Puzzled, he thought someone had appropriated his identity or was playing a prank. But it was no mistake. The two men began to correspond and found they had striking physical similarities during many periods in their lives. Their families had lived 2½ miles from each other in 1748 and the American Mr. Krebs' father and uncle emigrated from Germany in the 1900s. Their faces are the same shape, their hair is similar and their smiles are nearly identical. They wear similar eyeglasses, they both are married and have children, and their signatures are eerily similar. The two men even had DNA testing done last year, and while it showed they are not related, their bond of friendship has not diminished. "We've now decided we're blood brothers," said Mr. Krebs of Pennsylvania. In June, NEPA's Mr. Krebs and his wife traveled to Germany to meet his look-alike and were treated like royalty. "It was a thrilling moment in my life," said Pennsylvania's Mr. Krebs, who now is returning the favor by hosting his doppelganger and his family here in America. The German Mr. Krebs, who has been a mayor there for nearly 30 years, had been to the U.S. West Coast twice before, but this was his first trip to the Eastern U.S. After touring parts of New Jersey and New York City last week, the German Mr. Krebs and his family were honored at a reception Saturday attended by 150 people at Wallenpaupack Lake Estates. "Super," the German Mr. Krebs said in English of the dinner and continued in German. His daughter, Stefanie Hallerberg, translated for him: "I was overwhelmed by the program. The reception was terrific." Next, the two Krebs families will be going to Niagara Falls. While they share many similarities, the two men do have some differences. The Pennsylvania Mr. Krebs is a few inches taller than the Bavarian Mr. Krebs. The American Mr. Krebs is an only child, while the German Mr. Krebs has two brothers. NEPA's Mr. Krebs is a left-handed, while his doppelganger is right-handed. "We can't be identical twins," Pennsylvania's Mr. Krebs laughed. "You take any one of those factors and it could be a coincidence: same name, same age, same looks, (ancestors) living in the same area. But when you put all four of them together, it really defies the odds. Seriously defies the odds. I can't explain it."